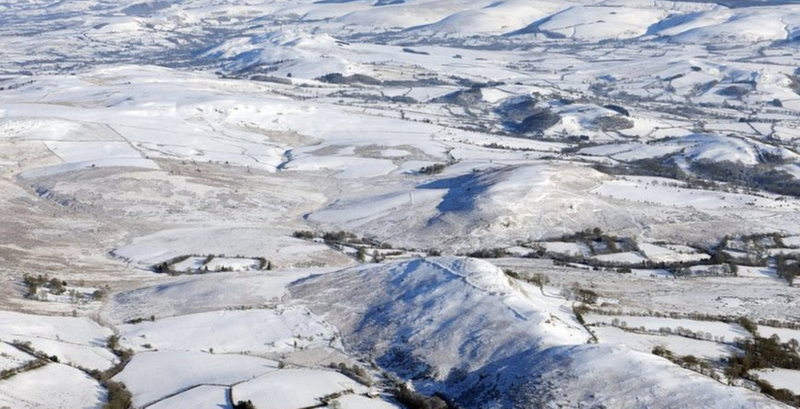 Archaeologists are using aerial photography and the recent snowfall to get a better view of the Welsh landscape with images like this showing the Brecon Beacons. 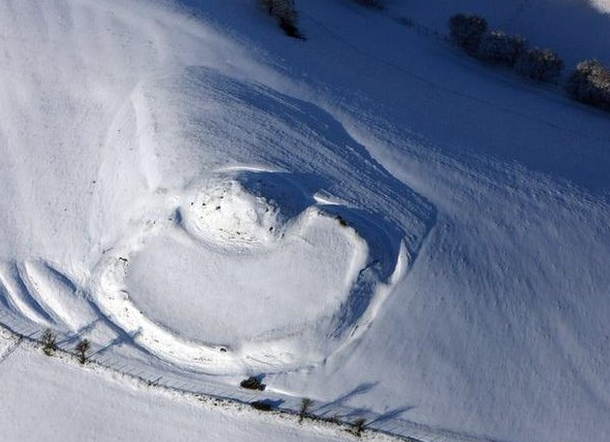 The Royal Commission on the Ancient and Historical Monuments of Wales (RCAHMW) says snow "evens out" the colours of the landscape allowing complex earthwork monuments to be seen more clearly like this view of the motte and bailey Castell Crugerydd alongside the A44 near Llandegley, Powys. 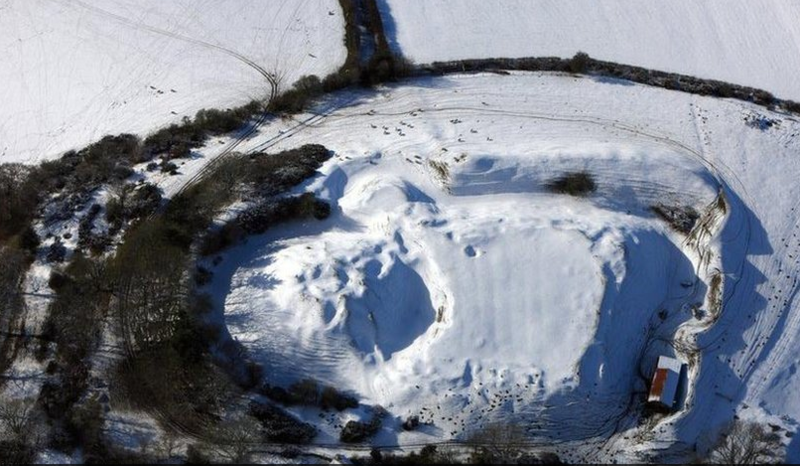 Photographer Dr Driver left the airport at Haverfordwest, Pembrokeshire, under rain showers, but he found the hills of eastern Wales were covered by a blanket of snow providing "immaculate conditions for earthwork recording combined with the low winter sun". This image shows the site of Painscastle, near Hay-on-Wye, Powys. The archaeologist used aerial reconnaissance over the Radnorshire commons east of Builth Wells and Llandrindod Wells, recording images to the south along the Usk Valley between Llangorse and Brecon passing the Brecon Beacons. He visited scheduled ancient monuments for Welsh heritage preservation society Cadw and was also looking for previously unrecorded archaeological sites for the National Monuments Record of Wales. 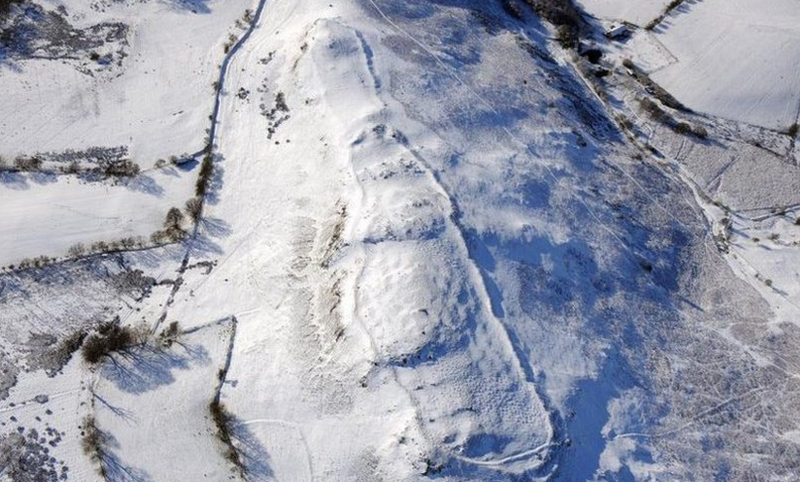 This is a view of Castle Bank hillfort near Llandrindod Wells. The Royal Commission says such "special weather conditions rarely last for long, making timely aerial reconnaissance imperative". This is a view of the landscape near Llandrindod Wells, looking from Castle Bank towards a rocky area known as Radnor Forest.